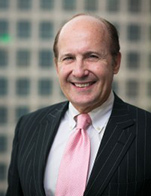 George Lucaci is a Partner and Senior Advisor for Mercury Capital Advisors. He was also Senior Managing Director of HedgeFund.net, one of Wall Street's first electronic alternative asset distribution platforms and spearheaded its capital raising business and broker-dealer. Mr. Lucaci has served variously as head of Proprietary FX Futures Arbitrage Trading at Citibank, was National Product and Sales Manager for Nomura Securities and Head of U.S. Fixed Income, and also served as a Director of Merrill Lynch's Mortgage-Backed Securities business. He earned a Bachelor of Arts degree from Duke University where he established the George Lucaci Endowment for Imaginative Writing. He received an M.B.A. from The George Washington University where he was a member of the Business School Board of Advisors for over ten years. He is the former President of the Summit, NJ Board of Education where he resides.